Happy Valentine's Day everyone! What are your plans for this day of love? I know for us today isn't going to be anything big. Romantic and simple is all I need, so tonight our plans our to put the kids to bed a little early, enjoy a drink or two and enjoy one another's company. I'm just glad my husband is home and not traveling today. I know I haven't done a Thirsty Thursday post in a long time, in fact this is the first one of the year, so I figured today is a perfect day to start and this drink or shot is perfect, especially for today. My husband travels to work in the states a lot and on his last visit he brought home Raspberry Bacardi. It's absolutely delicious you guys and great to make martinis with. 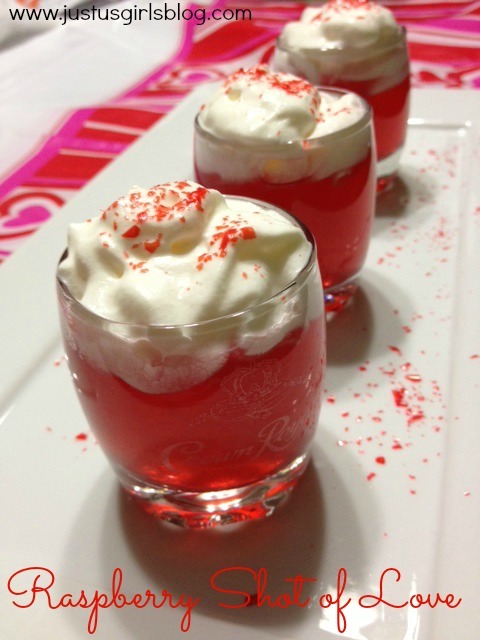 So I took a couple of ideas from the Strawberry Shortcake Martini drink that I shared with you all last Summer and created this week's Thirsty Thursday drink I like to call, Raspberry Shot of Love! This drink is simple to make and tastes so good. My husband was impressed when he tried it. His reaction, "It's good, but it's sweet and girly!" So I know most of you ladies out there will love it! What I also like about this is that it doesn't have to be a shot, you can also make it into a martini, the choice is up to you. Enjoy and Happy Valentine's Day! For the Raspberry Puree: Simmer for 10 minutes until sugar is dissolved and fruit is softened. Allow to cool and blend vigorously until smooth. If there are any pulp/seeds left, strain through a fine mesh strainer. Place ingredients in a cocktail shaker filled with ice and shake vigorously until chilled. Pour into shot glasses or if making drink a martini, pour into a martini glass and top with (optional) dallop of fresh whipped cream, and sprinkles. OMG,That looks to sooo tasty! I want one of those right now! Thanks for sharing this!